Just found your blog post when looking for the name of a pub in Edinburgh. You bumped into one of a tiny minority of racists, and tar us all with the same brush. I've lived in this area all my life, and have maybe met three. Sheesh. Maybe we just disagree what racism looks and sounds like. To me it's making a sweeping generalization about someone based on his/her ethnicity and/or nationality. 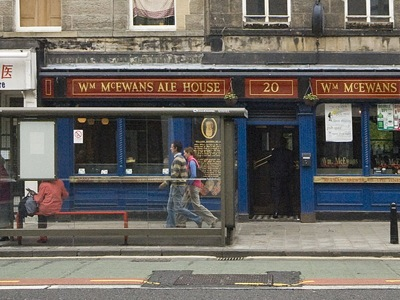 I overheard plenty of that kind of talk during my tour of Edinburgh pubs, mostly directed towards the Irish, English, and Welsh, but often about how all the foreign students should go home. A lot of it was said without malice, as was my comment about there being "a lot of racists"... it was to echo the exact words spoken by the lawyer I had just quoted. I was trying to be lyrical. Sorry to offend, but still, sectarianism/separatism seems alive and well in Scotland.